With its slanting design, movable steel parts, sturdy rubber and colour spots, GALAXY's space-age look and feel forms perfect 'constellations' for horizontal play. 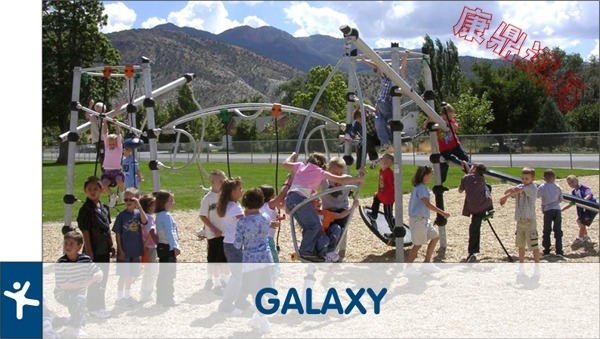 The versatile constellations comprise different play activities placed directly next to each other in a horizontal framework based on stabiles, links, anchors and accesses, which means that GALAXY's flexible framework can grow to any size or in any direction. All the activities demand physical strength and encourage experimentation, quite literally into the unknown! The open structure with small hangouts makes breaks between play and chats possible without losing the feeling of being seen and still being part of the play. The open structure has other benefits too. Firstly, it enables the equipment to blend in with its environment, allowing the landscape to be seen through it. Secondly, it allows for easy ground level access, encouraging inclusive play between children of all abilities. And with its futuristic design, it stands out as a sculpture. Furthermore, the sculptural appearance makes it possible to place them not only together with GALAXY constellations but also with other KOMPAN products. GALAXY sets excellent standards for durability and choice of materials. Galvanized steel, rubber and high-quality components are particularly robust and will stand up to the toughest conditions. Some of the constellations are especially designed for urban areas where vandalism is an issue.